Mammoth Hot Springs differ greatly from the geysers and hot pools further south in the park. The presence of limestone in the area, along with a major fault line delivering hot water to the Mammoth area has allowed the creation of a vast area of hot springs, travertine terraces and travertine flows. Limestone is readily and rapidly dissolved by hot water, creating travertine. Also, the area can be very colorful with bacteria in the pools and travertine stained by other minerals. The hot springs are very dynamic. Old hot water fissures may go dormant while new ones start up. Springs that have been dormant for years may become active again. New travertine formations build up extremely quickly. The rapidly shifting activity cause some springs to appear dead. However the location of springs and the rate of flow actually changes daily; on-again-off-again is the rule, not the exception. However the overall volume of water discharged by all of the springs fluctuates little. The Lower Terraces of Mammoth Hot Springs can be explored as a self-guided tour on about a mile of boardwalks. The most beautiful and popular formation, Minerva Terrace, is displayed at the top of this page. The terrace has gone through active and inactive periods over the years. When it is very active, the boardwalks can become quickly buried in travertine. The bizarre Liberty Cap, near the north end of the trail, is a 37 foot tall hot spring cone. The Upper Terraces can be explored on a narrow, one-way road (no trailers, vehicles under 25 feet long). The Mammoth area also includes Historic Fort Yellowstone. The park was administered and protected by the U.S. army from 1886 until the creation of the National Park Service in 1916. Because of the permanent nature of the mission, the fort’s buildings were constructed to last permanently. Some are still in use to this day. Self-guided tours are available. The are numerous good hiking trails in the area, ranging from one to 11 miles. The Beaver Ponds Loop Trail starts by the Liberty Cap and ends near the hotel and runs five moderate miles. The trail passes through meadowland, aspen stands, and past the beaver ponds. There is therefore an excellent chance to see a variety of wildlife such as elk, deer, pronghorn, and possibly black bear. Also, there are excellent mountain views. Wildlife is excellent in the area. The campground is adjacent to grazing land. 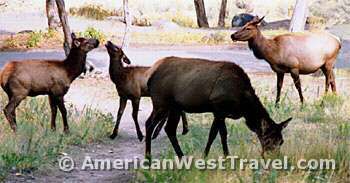 Elk, deer, and pronghorn often graze close to or through the campsites. Elk are especially prevalent, particularly during the fall rut when the bugling reverberates throughout the area. Beaver Ponds Loop. Round trip 5 miles (8 km), moderately strenuous. The trail begins between Liberty Cap and a stone house in Mammoth Hot Springs. It follows Clematis Creek, climbing 350 feet (107 m) through forest to meadows of sage and stands of Douglas-fir and aspen. After hiking 2.5 miles (4.0 km), you reach the beaver ponds. You might see beavers or their sign, but you are more likely to see muskrats and water birds. The trail continues through mixed forest and meadows, and ends on the Old Gardiner Road behind the Mammoth Hotel. Bunsen Peak. Round trip 4.2 miles (6.7 km), moderately strenuous. The trail begins at the entrance of the Old Bunsen Peak Road Trail, 5.0 miles (8.0 km) south of Mammoth on the Grand Loop Road. Climb 1,300 feet (394 m) through forest to the summit, which features panoramic views. Return by same route. The nearby Old Bunsen Peak Road Trail is closed to vehicles but open for hiking and biking. Wraith Falls. Round trip 1 mile (1.5 km), easy. The trail begins at a pullout 0.5 miles (0.8 km) east of Lava Creek Picnic Area on the Grand Loop Road. This short, easy trail passes through sagebrush meadows, marshland, and mixed conifer forest to the base of 79-foot (24 m) Wraith Falls on Lupine Creek. Detailed Map of Mammoth area. Guide to Historic Fort Yellowstone. Includes interactive map. 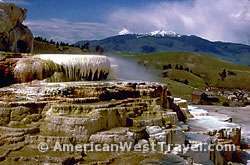 Interactive Tour & Map of Mammoth Hot Springs area. Shows trails and all the features. Hot links to descriptions. Mammoth Hot Springs Trip Planner. Official NPS guide. Day Hikes in the Mammoth Hot Springs Area. Albright Visitor Center and Museum is located in Mammoth Hot Springs. The rustic building was originally part of Fort Yellowstone and was once the bachelor officers’ quarters. Includes visitor desk, backcountry office, theater, and Yellowstone Association book store. The museum focuses on area history but also displays the Moran Gallery of watercolors and the Jackson Gallery of photography. Both men were part of the 1871 expedition which discovered Yellowstone. Food services, medical clinic, general stores, gift shops, gas station, post office, and picnic area.